This post is long overdue but here goes. Since its release, my iOS game Hit The Button RPG was not a very social experience for the players. Of course it had the Game Center leaderboards for showing off who has the most experience, but an important social feature was missing: players weren’t able to share their character with other players to show off progress and the items they’ve found. This was changed with Hit The Button RPG 1.2. This feature was on the back of my mind for a long time. There were a couple of options how to realise it. The simplest one would have been adding a button which would tweet the character information in a standardised fashion – e.g. 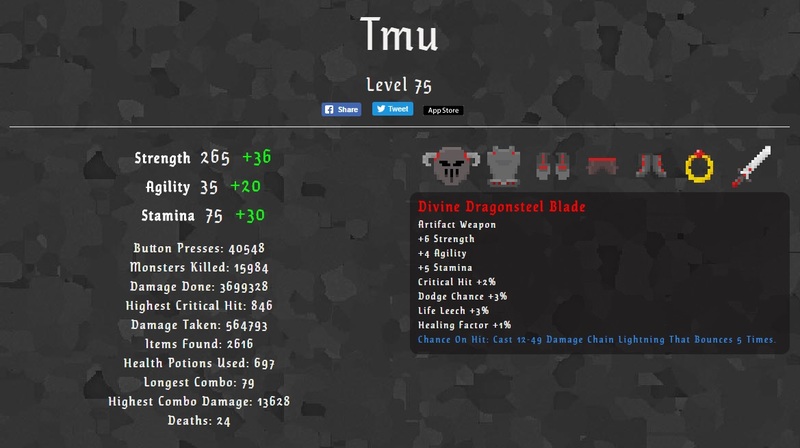 “Tmu | lvl 73 | str 265+36 agi 35+20 sta 75+30 #HitTheButtonRPG”. The amount of information would have been quite limited and the format would not have been reusable in other social media platforms like on Facebook or gaming forums. The website checks the Profile ID (e.g. A490412E-5DC4-4A5F-94B1-EB3D00878E11-0) from the URL. Renders the save game as a web page. To summarize: it was easy to add this kind of web profile functionality, even to an existing app that wasn’t designed with this kind of use case in mind. Web profiles are pretty cool as they enable extending the apps functionality. In this case, I’ve added displaying some of the character statistics to the web profile. In the actual Hit The Button RPG 1.2 iOS application these statistics are not visible anywhere even though they are collected. Hit The Button RPG 1.1 – Now with weapons! Last week I released the first major minor update for Hit The Button RPG and it is available on the App Store. Along with some balancing changes the big new feature was the addition of weapon drops. While weapons essentially work like other equipment – monster drop them, you equip them and gain stats, rinse and repeat – they add a new twist: chance on hit effects. So far four effects have been implemented: stun, bleed, knock back and chain lightning. In spirit of the rest of the game, the chance on hit effects have randomly generated attributes such as probability, duration and how many times the lightning can bounce. During play testing the new effects seemed a bit underpowered but I’d rather start with them as such and perhaps give them a nice buff later on. Definitely the neatest thing is that the equipped weapon is shown on character during action. It adds such a nice visual element that I may consider adding similar approach for other item slots. There’s a new project project page available with some retrospective thoughts for my first mobile phone application: WaterBox. Released in July 2008, WaterBox was a fluid simulator for Symbian S60v3 phones (like Nokia N95) that is based on smoothed-particle hydrodynamics.